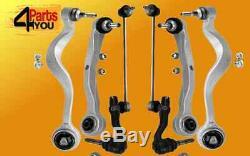 Set Barre Transversale BMW tous E60 Essieu avant 5ER E61 HQ BRAS SuspensioN. 2x ANTI ROLL BAR LINK. BMW 5 (E60) 520 d 130 KW 1995 CCM 177PS 2007/09->2010/03. BMW 5 (E60) 520 d 120 KW 1995 CCM 163PS 2005/07->2010/03. BMW 5 (E60) 520 d 110 KW 1995 CCM 150PS 2005/09->2010/03. BMW 5 (E60) 520 i 125 KW 1995 CCM 170PS 2007/09->2010/03. BMW 5 (E60) 520 i 115 KW 1995 CCM 156PS 2006/04->2009/12. BMW 5 (E60) 520 i 120 KW 1995 CCM 163PS 2006/12->2010/03. BMW 5 (E60) 520 i 125 KW 2171 CCM 170PS 2003/07->2010/03. BMW 5 (E60) 523 i 140 KW 2497 CCM 190PS 2007/01->2010/03. BMW 5 (E60) 523 i 130 KW 2497 CCM 177PS 2005/07->2010/03. BMW 5 (E60) 525 d 120 KW 2497 CCM 163PS 2004/12->2010/03. BMW 5 (E60) 525 d 130 KW 2497 CCM 177PS 2004/06->2010/03. BMW 5 (E60) 525 d 145 KW 2993 CCM 197PS 2007/01->2010/03. BMW 5 (E60) 525 d xDrive 145 KW 2993 CCM 197PS 2008/09->2010/03. BMW 5 (E60) 525 i 160 KW 2996 CCM 218PS 2007/01->2010/03. BMW 5 (E60) 525 i 141 KW 2494 CCM 192PS 2003/09->2010/03. BMW 5 (E60) 525 i 160 KW 2497 CCM 218PS 2005/07->2010/03. BMW 5 (E60) 525 i xDrive 160 KW 2996 CCM 218PS 2008/09->2010/03. BMW 5 (E60) 525 xd 145 KW 2993 CCM 197PS 2007/01->2010/03. BMW 5 (E60) 525 xi 160 KW 2996 CCM 218PS 2007/01->2010/03. BMW 5 (E60) 525 xi 160 KW 2497 CCM 218PS 2005/07->2010/03. BMW 5 (E60) 530 d 160 KW 2993 CCM 218PS 2003/07->2010/03. BMW 5 (E60) 530 d 173 KW 2993 CCM 235PS 2007/01->2010/03. BMW 5 (E60) 530 d 155 KW 2993 CCM 211PS 2003/07->2010/03. BMW 5 (E60) 530 d 170 KW 2993 CCM 231PS 2003/07->2010/03. BMW 5 (E60) 530 d xDrive 173 KW 2993 CCM 235PS 2008/09->2010/03. BMW 5 (E60) 530 i 200 KW 2996 CCM 272PS 2007/01->2010/03. BMW 5 (E60) 530 i 187 KW 2996 CCM 254PS 2005/03->2010/03. BMW 5 (E60) 530 i 170 KW 2979 CCM 231PS 2003/07->2010/03. BMW 5 (E60) 530 i 190 KW 2996 CCM 258PS 2005/07->2010/03. BMW 5 (E60) 530 i xDrive 200 KW 2996 CCM 272PS 2008/09->2010/03. BMW 5 (E60) 530 xd 173 KW 2993 CCM 235PS 2007/01->2010/03. BMW 5 (E60) 530 xd 170 KW 2993 CCM 231PS 2005/07->2010/03. BMW 5 (E60) 530 xi 200 KW 2996 CCM 272PS 2007/01->2010/03. BMW 5 (E60) 530 xi 190 KW 2996 CCM 258PS 2005/07->2010/03. BMW 5 (E60) 535 d 210 KW 2993 CCM 286PS 2007/01->2010/03. BMW 5 (E60) 535 d 200 KW 2993 CCM 272PS 2004/09->2010/03. BMW 5 (E60) 540 i 225 KW 2979 CCM 306PS 2005/08->2010/03. BMW 5 (E60) 540 i 225 KW 4000 CCM 306PS 2005/07->2010/03. BMW 5 (E60) 540 i 225 KW 3982 CCM 306PS 2005/09->2010/02. BMW 5 (E60) 545 i 245 KW 4398 CCM 333PS 2003/09->2010/03. BMW 5 (E60) 550 i 270 KW 4799 CCM 367PS 2005/07->2010/03. BMW 5 (E60) M 373 KW 4999 CCM 507PS 2004/09->2010/03. BMW 5 Touring (E61) 520 d 130 KW 1995 CCM 177PS 2007/09->.. BMW 5 Touring (E61) 520 d 110 KW 1995 CCM 150PS 2005/09->.. BMW 5 Touring (E61) 520 d 120 KW 1995 CCM 163PS 2005/07->..
BMW 5 Touring (E61) 520 i 125 KW 1995 CCM 170PS 2007/09->.. BMW 5 Touring (E61) 520 i 120 KW 1995 CCM 163PS 2007/07->2010/08. BMW 5 Touring (E61) 523 i 140 KW 2497 CCM 190PS 2007/01->.. BMW 5 Touring (E61) 523 i 130 KW 2497 CCM 177PS 2005/07->.. BMW 5 Touring (E61) 525 d 130 KW 2497 CCM 177PS 2004/06->.. BMW 5 Touring (E61) 525 d 145 KW 2993 CCM 197PS 2007/01->.. BMW 5 Touring (E61) 525 d 120 KW 2497 CCM 163PS 2004/12->.. BMW 5 Touring (E61) 525 d xDrive 145 KW 2993 CCM 197PS 2008/09->.. BMW 5 Touring (E61) 525 i 160 KW 2497 CCM 218PS 2005/07->.. BMW 5 Touring (E61) 525 i 160 KW 2996 CCM 218PS 2007/01->.. BMW 5 Touring (E61) 525 i 141 KW 2494 CCM 192PS 2004/06->.. BMW 5 Touring (E61) 525 i xDrive 160 KW 2996 CCM 218PS 2008/09->.. BMW 5 Touring (E61) 525 xd 145 KW 2993 CCM 197PS 2007/01->.. BMW 5 Touring (E61) 525 xi 160 KW 2497 CCM 218PS 2005/07->.. BMW 5 Touring (E61) 525 xi 160 KW 2996 CCM 218PS 2007/01->.. BMW 5 Touring (E61) 530 d 170 KW 2993 CCM 231PS 2005/07->.. BMW 5 Touring (E61) 530 d 173 KW 2993 CCM 235PS 2007/01->..
BMW 5 Touring (E61) 530 d 160 KW 2993 CCM 218PS 2004/06->.. BMW 5 Touring (E61) 530 d xDrive 173 KW 2993 CCM 235PS 2008/09->.. BMW 5 Touring (E61) 530 i 200 KW 2996 CCM 272PS 2007/01->.. BMW 5 Touring (E61) 530 i 190 KW 2996 CCM 258PS 2005/07->..
BMW 5 Touring (E61) 530 i xDrive 200 KW 2996 CCM 272PS 2008/09->.. BMW 5 Touring (E61) 530 xd 173 KW 2993 CCM 235PS 2007/01->.. BMW 5 Touring (E61) 530 xd 170 KW 2993 CCM 231PS 2005/07->.. BMW 5 Touring (E61) 530 xi 190 KW 2996 CCM 258PS 2005/07->.. BMW 5 Touring (E61) 530 xi 200 KW 2996 CCM 272PS 2007/01->.. BMW 5 Touring (E61) 535 d 210 KW 2993 CCM 286PS 2007/01->.. BMW 5 Touring (E61) 535 d 200 KW 2993 CCM 272PS 2004/09->.. BMW 5 Touring (E61) 545 i 245 KW 4398 CCM 333PS 2004/06->.. BMW 5 Touring (E61) 550 i 270 KW 4799 CCM 367PS 2005/07->.. BMW 5 Touring (E61) M 373 KW 4999 CCM 507PS 2007/02->..
-You have 20 days to inform us that you are returning the item, provided the part has not been fitted and is still in its original packaging. Then at our discretion we will decide the next course of action. Set Barre Transversale BMW tous E60 Essieu avant 5ER E61 HQ BRAS SuspensioN" est en vente depuis le jeudi 4 février 2016. Il est dans la catégorie "Auto, moto pièces, accessoires\Auto\ pièces détachées\Suspension, direction\Bras de suspension". Le vendeur est "parts4youpl" et est localisé à/en Brzozów.